Got out with Doug Roland and Ryan Rice who have begun to chronicle their adventures in the Charleston/Lowcountry area here in South Carolina. I was able to hop aboard Doug’s Hells Bay, and after a short drive through the Spanish moss covered Oak highway, we got to the launch, and seemed to have it to ourselves. The cool thing about Doug’s boat, besides it being a damn good boat was the chair that was in it. 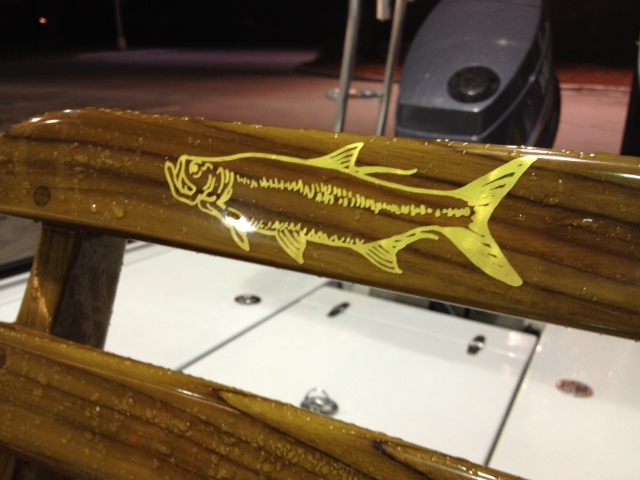 A wooden fighting chair that had a gold leaf inlay of a Tarpon. 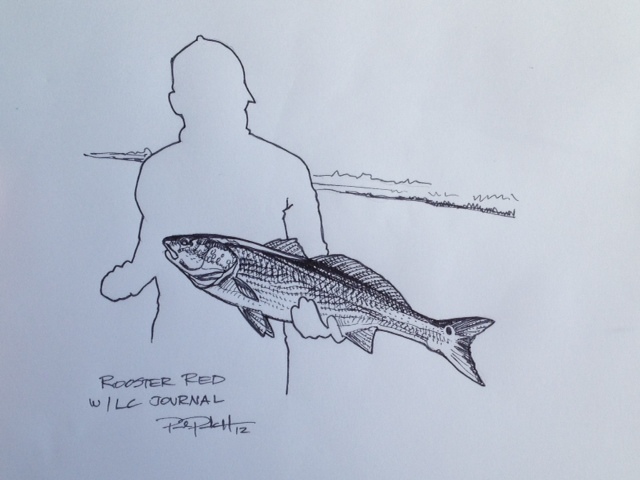 Now, about 5-6 years ago, I did my first drawing of a Tarpon for Patrick Dunn so that he could use it to give to the chair-maker that was going to lay the art into the wood. I had forgotten about it until I saw the fighting chair, then it all came back to me as Doug explained the lineage of the boat and its prior owners. It was very col to see the final piece for the first time. We had a great time fishing of course, but only caught one fish. As the nights have gotten colder, less and less crabs are up on the flats which is slowing the fish tailing down a bit. As we get deeper into the fall, most of the fish are going to be caught at lowtide in the mud flats, which I cant wait to see happen. Lowcountry Journal is putting together a film which will take all Fall and Winter to put together. The final piece will be very cool, and here is a little snipet from this weekend’s action. wait. so that was your drawing for that actual chair!? Paul, I got chills reading this. Thanks for posting! !